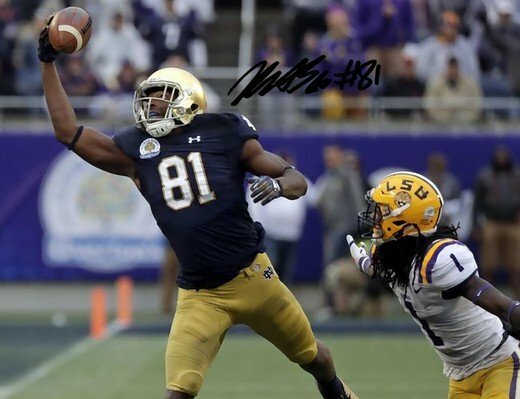 MILES BOYKIN SIGNED PHOTO 8X10 RP AUTOGRAPHED NOTRE DAME FOOTBALL ! MILES BOYKIN Autographed signed 8x10 high gloss photo. This photo is in excellent condition and would look great matted or framed. Photo will be shipped out with protection and in a plastic sheath for water protection. I have a huge collection of authentic autographs and this is a reprint of my hand signed original. All photos come with a full 100% Guarantee or your money back ! No questions asked, I stand behind my customers. SCOTT DIXON SIGNED PHOTO 8X10 RP AUTOGRAPHED ** INDY 500 CRASH ! JADEVEON CLOWNEY SIGNED PHOTO 8X10 RP AUTOGRAPHED SOUTH CAROLINA MICHIGAN HIT !